A PREVIEWS Exclusive! 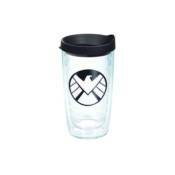 Fans of ABC's hit series Marvel's Agents of SHIELD can now add drinkware that bears the circular S.H.I.E.L.D. logo! Available only through PREVIEWS, you can choose from a 24-ounce water bottle, a 24-ounce tumbler, a 15-ounce mug, and a 16-ounce tumbler.